This CS:GO Danger Zone Guide will show you how to be the last man standing in online multiplayer game play. 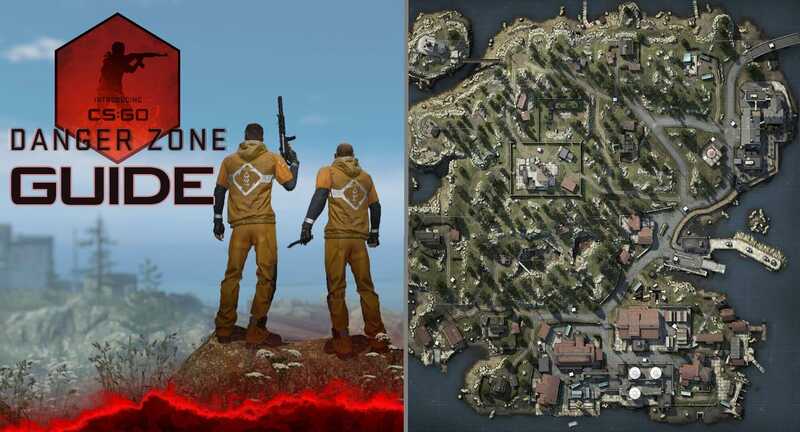 Counter Strike: Global Offensive Battle Royal mode was released several days ago and many players are struggling to be the last man standing. It’s not easy to get used to the new mode, especially if a player hasn’t played Battle Royal games before. Danger Zone is much different from the regular CS:GO game. First of all, the map is way bigger and it is more open. Secondly, you start with nothing, and you need to search for weapons and ammo. Then, you have to avoid the narrowing Red zone and take care of many other things. The same scaneario happened with Call of Duty Black Ops 4 “Blackout” where players who never played the game needed to grasp the concept of one vs all type of game. The same concept of gaming but now in CS:GO which is incredibly exciting, but can be frustrating if you’re still grasping the game mode. So, let’s see what to do in order to win Danger Zone match. Most of the players just walk around and start jumping during the warm-up; they don’t pay attention to map details. A warm-up is not there just to waste some time. It is called warm-up for a good reason. There is not really any other way to study the map, so you should use this time as best as you can. Surely the map is too big to study it for three minutes. Therefore pick a part of the map and spend all the time analyzing it. Look for convenient covers, good nests, weak points, advantages, trap locations, etc. You might not dominant that part of the map in the new few matches, but look at it like it is an investment for better gameplay down the road. If you stick to one part of the map, learn all the tricks of the trade then you’ll be able to move onto other parts of the maps. This way, within a month (if you play a lot of CS:GO Danger Zone), you’ll be fine-tuned where you’ll be capable to pull yourself out of any situation. This is truly survival mode. Once you examined each corner on the map, you should choose your landing tactic. Essentially, it means you have to choose whether you want to pick your favorite spot, or you prefer to wait and see other’s players landing points. Both have its advantages and drawbacks, so it is only up to you what you like more. If you choose to pick grounding point immediately, that will place you on your favorite location, but you can finish end up with a bunch of opponents around you, which is not good. On other hand, you can avoid that and be the last one player who picked. But then you won’t have so many choices. Perhaps the best location to select is the Lighthouse (Game Life opinion). It is a secluded place with high ground but it is not easily accessible. The bad thing is that is placed on the edge of the map, so you will probably finish in Red Zone quickly. Thus, it’s good to have a plan B once the red zone starts closing in; where’s your next point? This is another common mistake that many players make. They think it is better to save the money for the late phase of the match so they can buy top weapons. The thing is that you will rarely reach the very late phase of the match, and you will hardly save enough money for the best weapons. In addition, after some time there will be free supply drops on the map with the best weapons. If you don’t buy items at the beginning, other players will have an advantage over you and will easily eliminate you. This way, by spending money it gives you a fighting chance and a fair level playing ground. Don’t be cheap! Ammo is your best friend in CS:GO Danger Zone. It’s not always the case, but most of the time the player with most ammunition wins the game. Buy the ammo instead of best weapons. Weapons are useful tools, but bullets are those that kill opponents. So, be clever, don’t shoot just because you want to; try to be accurate. Always use pistols (or snipers if you got any) for a long-range fight. Use rifles only in close combat, because bullets deplete quickly. As well, don’t use ammo crates for bad weapons such as shotguns (which are usually useless in Danger Zone). Sounds have always been a very important factor in CS:GO. It is very important to listen for steps and other sounds such as taking the ammo from ammo crates, closing or opening doors, drone sounds, etc… Knowing that closing and/or opening the doors can make a sound, you should always close them after coming into the house. You will know if someone entered the house, and you can prepare a nice trap for him. Another point to make is invest in good a good headset like Turtle Beach. You don’t need the $499 headsets. There’s plenty out there for under $100. If you’re still using your TV’s speakers as a sound source, then you’re living the past. Almost every gamer playing these type of games have a gaming headset. You can shot opponents’ drones – that means that you can steal their weapons or supplies, but be cautious as they will know that you stole their weapons. Learn the difference between boxes – there are five types of boxes: blue(Ammo, Adrenalin, Flashbang or Decoy and melee weapons), yellow (bombs and grenades), small red(pistols), big red(rifles and shotguns – you cannot open it with fists) and supply drops(big whites and reds). C4 explodes instantly in the red zone – so don’t plant it there. You can pick up parachute after using it – don’t be lazy, pick it up!